Woke Up This Morning and Found Myself Dead is a posthumous live album by Jimi Hendrix released in Canada 1980 by Stony Plain Recording Co. and in the USA by Red Lightnin’ Records. The album documents Hendrix’s jam session (which he recorded himself on his portable reel to reel machine that he had brought with him) at The Scene club, 301 West 46th Street, New York City in March 1968, with guest vocals from Jim Morrison (that consist almost entirely of drunkenly shouted obscenities). Other musicians on the recordings are unknown, though it is possible that the bassist is Randy Hobbs and the drummer is Randy Zehringer, members of The Scene’s house band at the time. It has been rumored that Noel Redding and Johnny Winter also appear. Winter himself has denied that he took part in the jam, saying he never met Jim Morrison, although at times during the recording a second lead guitar (at a lower volume than Hendrix’s) can be heard playing in an electric blues style. 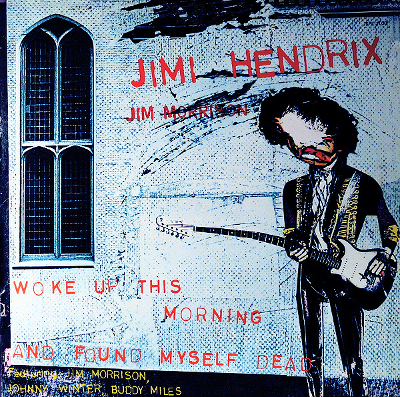 The LP release is interesting for its strange depiction of Hendrix on the cover (an illustration by artist George Snow).